In case you haven't heard, this is absolutely the best time ever to be a Star Wars fan. Apart from all the amazing content on television and in books and comics, we also have a new feature film to look forward to every year. While the we currently have Rogue One and the Han Solo standalone film, as well as Episodes VIII & IX on the horizon, it appears there is no end in sight for future films. Variety is reporting that Disney CEO Bob Iger spoke to investors at a Goldman Sachs conference today and discussed a number of things, including the future of the Star Wars saga. Reportedly, Iger said that he recently met with Lucasfilm President Kathleen Kennedy and mapped out upcoming Star Wars films through 2021 and beyond. Iger also mentioned that they have found a writer for another upcoming standalone film, one which will most likely be released in 2020(the film we presume Josh Trank was previously hired to direct). Given that numerous accolades The Force Awakens earned during it's box office run, including becoming the highest grossing film domestically, it will be difficult for all future Star Wars films to match or surpass it. It's good to hear the powers that be at Disney have realistic expections for these films. 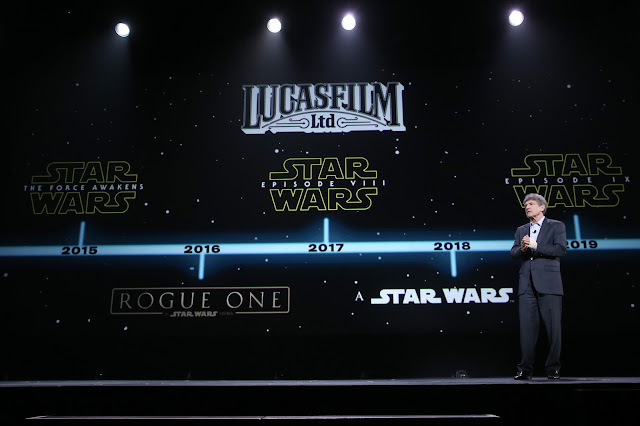 It's also very exciting to know that plans are already underway for Star Wars films in the next decade. On the Star Wars Underworld Podcast we have speculated previously about how many films to expect in the future, and whether or not there will be breaks in the release schedule at some point. Personally, I'm thrilled that we have a new Star Wars film to look forward to every year for, well, seemingly forever. There's no such thing as too much Star Wars in my book! If everything is open for Disney and Lucas Film then I will prefer or maybe somebody did already solo standing movie about Boba Fatt and dream about Dark Side trilogy Darth Bane. This will be insane for me and other fans. I hope they take a real Star Wars Director. Not a "great" Hollywood one.